Election 2018 – Page 53 – Welcome to Wyandotte Daily! 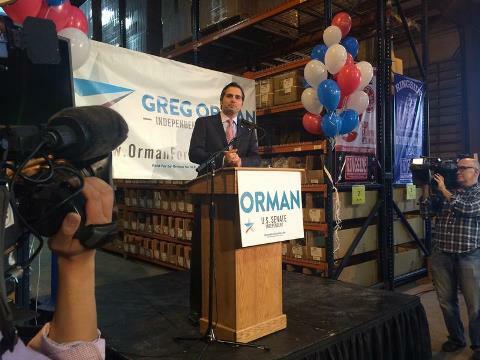 Olathe businessman Greg Orman launched an independent campaign for governor Wednesday, ending months of speculation about his political plans. Orman’s entry sets up a three-way contest that some say neither he nor the Democratic nominee can win. “I think he will guarantee the Republican — likely Kris Kobach — wins,” said University of Kansas political scientist Patrick Miller, referring to Kansas’ high-profile but controversial secretary of state who is one of 13 candidates seeking the GOP nomination for governor. Several of the six Democrats running could get enough support from independents and moderate Republicans to defeat Kobach in a head-to-head race, Miller said. But the advantage would go to Kobach, or whoever wins the GOP nomination, if the vote is split three ways, he said. Former state Sen. Tim Owens disagrees with that assessment. He signed on as Orman’s campaign treasurer because he believes deepening partisan divisions in the country have made candidates who reject party labels more viable. “It’s something that historically has been a tough thing, but if there was ever a right time it’s now,” Owens said. Owens, a moderate Republican from Overland Park who lost his Kansas Senate seat in the conservative wave of 2012, said if Kobach wins the primary, GOP voters opposed to him would welcome an opportunity to support someone other than the Democrat. “This gives them an opportunity to vote for somebody else without switching parties,” he said. Running as an independent and without Democratic opposition in 2014, Orman threw a scare into Republican U.S. Sen. Pat Roberts. But a late surge powered by millions of dollars that flowed to his campaign from out-of-state donors propelled Roberts to a 10-point win. After the loss, Orman wrote a book, “A Declaration of Independents,” in which he argues that the corruption of both major parties by powerful special interests has disenfranchised average Americans. As an independent, Orman won’t have to worry about getting through a primary but will have to collect 5,000 signatures on a petition to be assured of a spot on the Kansas general election ballot alongside the Republican and Democratic nominees. Orman has varied business interests. In 1996, he profited from the sale of a company he founded — Environmental Lighting Concepts — to Kansas City Power and Light. He now holds interests in a private equity firm and a partnership that owns a Lenexa-based boxing equipment manufacturer.